The University of M.U.S.C.L.E. is certainly not the first M.U.S.C.L.E. website on the internet. The goal of the University of M.U.S.C.L.E. is to provide a single, easily navigated location with the most comprehensive and constantly updated coverage of Mattel’s M.U.S.C.L.E. toys. The Website Review will take an impartial look at various M.U.S.C.L.E. websites and share the pros and con of each site. The first M.U.S.C.L.E. 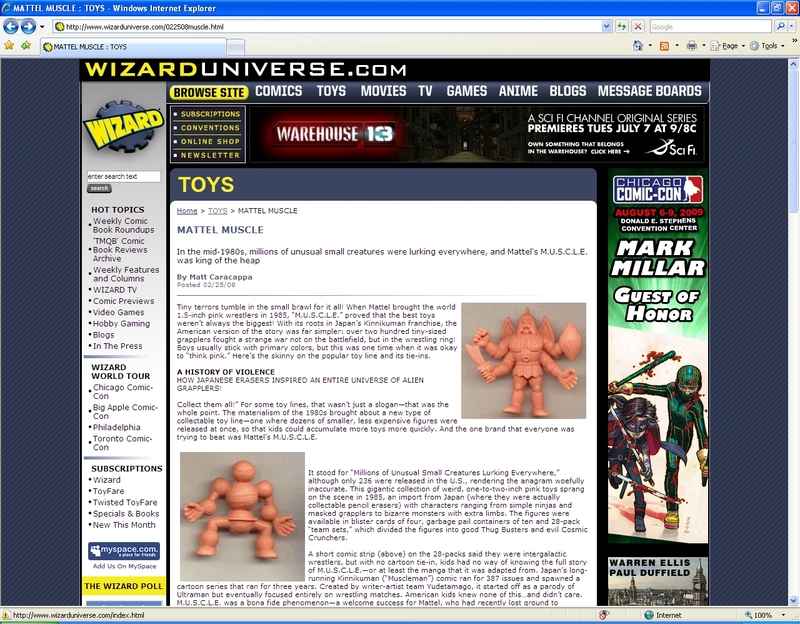 website is from Wizard Magazine’s Toy Section and the article was written by Matt Caracappa, the proprietor of X-Entertainment.com. This is not Matt’s first M.U.S.C.L.E. article. He is probably most famous with M.U.S.C.L.E. collectors for his several M.U.S.C.L.E. write-ups from his X-entertainment website – which will likely be reviewed in the future. This article was posted on February 25, 2008. Matt is clearly very familiar with M.U.S.C.L.E. figures. He does not make any blatant factual errors. Matt wrote about two issues that could be open to some interpretation or debate: (1) the 236 figures; and (2) the timeline regarding Battle Beasts and color M.U.S.C.L.E. figures. The 236 figure count is widely considered the correct count for a basic flesh set by collectors. The 236 figure count does not acknowledge the presence of Super Rare figures in anyway. The count may not be wrong, but it does have an important omission. The timeline and scenario with M.U.S.C.L.E. figures, Battle Beasts, and Army Ants is also debatable. M.U.S.C.L.E. first appeared in US stores in late 1985 and was discontinued as a Mattel product after the 1987 catalog year. Hasbro released Army Ants and Battle Beasts around 1987. While these may have been brought to market because of the success of M.U.S.C.L.E they were never posed in direct sales competition. Without exact sales figures, it is difficult to say where each toy would have ranked. It is worth noting that M.U.S.C.L.E. had been labeled a top-selling toy by Playthings magazine in 1986. The UofM is unaware of any similar accolades for Battle Beast or Army Ants. Wizard’s website is quite standard – plenty of advertising and fairly simple to navigate. The M.U.S.C.L.E. specific portion of the website is very basic; one page of text with three simple pictures. It is interesting that Satan Cross is selected as one of the pictures, but Matt never mentions the interesting story associated with the figure. Matt’s selection of Satan Cross is either comically lucky or a missed opportunity to enrich the writing. The remaining pictures are simply fine. Matt mentions 236 figures but disappointingly only offers three pictures. On the plus side, all of the pictures are clear and pop-up in a new window when they are clicked on. The strongest part of Matt’s article is that there are not any glaring errors. He does a nice job of quickly encapsulating the history of M.U.S.C.L.E. and mentions the more recent history of the Kinnikuman brand in Japan. This website is probably a good one for people completely unfamiliar with M.U.S.C.L.E. toys, but offers very little to the M.U.S.C.L.E. collector. This entry was posted on Friday, June 26th, 2009 and is filed under UofM News. You can follow any responses to this entry through RSS 2.0. You can skip to the end and leave a response. Pinging is currently not allowed. I have added an email contact to my profile and the bottom of every page. The hundreds digit of a course number is a rough estimate of its relative difficulty. 100-level courses often cover basic material, and are geared towards freshmen. 200-level courses are likely more complex and difficult, 300-level courses more so. Higher level courses often have prerequsite courses from lower levels. The higher levels, such as 700, 800, and 900, are often used to designate graduate-level courses. yes but what I meant was I’ve never seen or taken a class that was exactly 100 or 200, it’s always at least 101 or something else. I dunno, it doesn’t really matter, I was just thinking if you added 01 to the numbers it might make it more college-like. As of right now I probably won’t do that, but if topics arise that deserve there own “course” they will probably be appropriately placed between 100 and 200 courses.